Wheee! I’ve apparently fallen in love with penguins…because I discovered I’ve picked up a ton of penguin stamps this year! 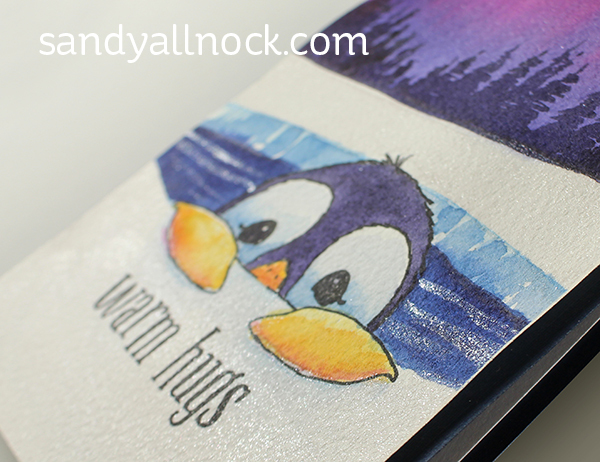 I decided to combine them in one big ol’ week full of penguin cards – I hope my penguin-loving friends will enjoy the stamps, and my technique-loving friends will enjoy learning too! These little peeking critters had to be in penguin week! The little penguin is coming up from a swim to say hello to you – and to peek at the arctic aurora borealis while he’s up for air! Watch the video below or click HERE to see it in HD on YouTube. 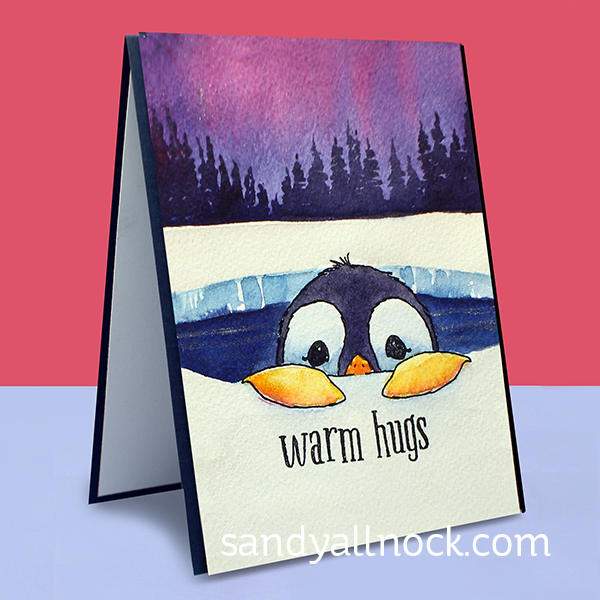 What a little cutie patootie penguin….he’s ready for a warm hug! Here’s that pearlescent shimmer paint – it looks fantastic in person! All colors used are listed in the supplies. What ink did you use to stamp these in? Did you go back over them after painting with a pen? Versafine onyx black. And no I didn’t go back over anything. These cards are super cute! I love your background. It’s one of the few I’ve seen that actually looks like the aurora borealis. What a wonderfully unique idea. Using all your penguin stamps to do a creative, week-long penguin march of creations. Yippee! Can hardly wait. Great I love pinguins, they are so cute. 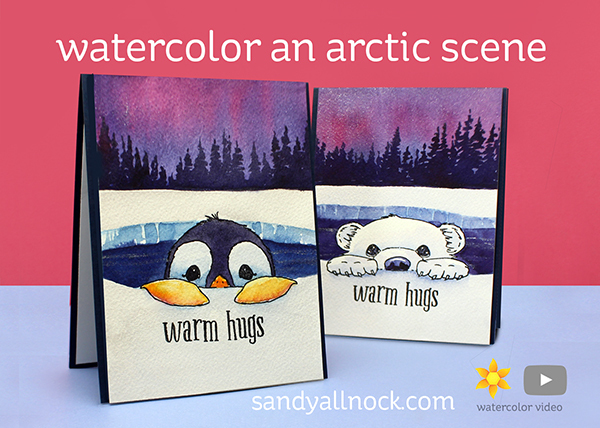 This card is awesome, I love the way you painted the hole in the ice, the thickness of the ice, when you do it is seem so easy. Thank you so much Sandy for everything you learn me in each video. These are just Sooooo Adorable!!!! just like a child liking candy I really like these cards; thank for sharing. Who would’ve thunk it – penguin week! Brilliant. Love this card! Is this an Impression Obsession stamp the same as the kitty and the puppy? Such cute scenes. These paintings remind me that even though I enjoy Copic Markers and my pencils too, there is something about watercolors that pulls me a little stronger. I’m soooo excited to see penguins. Our daughter is a missionary and she is our lil’ penguin. She adores penguins. We have 4 stuffed cutie penguins that are residents on one of our living room side tables whenever she is away. She is away right now and I just discovered the Art Impressions little penguin above yesterday. Can’t wait to receive it and now I know how to build a little scene. Thanks Sandy! Oh Wow!! These are so so gorgeous Sandy! Gotta love those penguins – love your Northern Lights, too! So adorable! Looking forward to the rest of the week!